I am going to be completely honest. I am an easily excitable person. It doesn’t take much to blow me away and capture my attention. I liken myself to a capuchin monkey who is easily distracted and impressed by shiny objects. Well, last Thursday night I hit the jackpot of dangling shiny objects. The annual Duke Energy Yuletide Celebration presented by the Indianapolis Symphony Orchestra is an event of glitter, music and pizazz that forever redefined my perception of Christmas entertainment. I did not know what to expect when I walked into the Hilbert Circle Theater with my Travel Marketing class on Thursday night for the show’s dress rehearsal. I knew that Yuletide was the annual Christmas Spectacular of the ISO, but I wasn’t prepared for the degree to which I was going to experience Christmas cheer. Part of me thought that I was going to respectfully clap for beautiful orchestral renditions of traditional Christmas songs. This didn’t seem like a particularly exciting prospect. While I appreciate live musical entertainment, orchestras make me a little sleepy. Luckily, I was pleasantly surprised once the show got underway. Not only was there zero chance that I was going to fall asleep, I didn’t even want to blink, risking missing even a second of this spectacular show. This year, Yuletide was hosted by the incomparable five-time Grammy Award winner Sandi Patty. Her operatic style paired with my favorite carols sent chills throughout my body and resulted in a fixed smile on my face that lasted through the show, the car ride home, and left visions of sugar plums dancing in my head as I slept. Another treat was Yuletide’s conductor, Jack Everly, who was energetic and engaging. I was officially feeling the Christmas spirit. 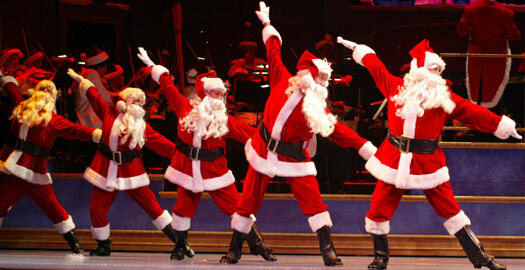 In addition to Ms. Patty and Maestro Everly, Yuletide was an extravaganza of tap dancing Santas, a tribute to Irving Berlin’s “White Christmas” and a thoroughly entertaining magic act starring Les Arnold and his enthusiastic assistant Dazzle. This duo has accurately been described as the magic world’s Ricky Ricardo and Lucy. While I’m not the biggest fan of the orchestra, Yuletide turned out to be a beautiful – and at times, hilarious – variety show. This show is amazing and comes so highly recommended for a reason. It is something you are going to want to see again and again. It is Indianapolis’ Christmas tradition and it does not disappoint. For more information and to purchase tickets, Click here to visit the Indianapolis Symphony Orchestra’s website.